Improving balance sheet health also reflected in a down tick in interest expenses relative to revenue until 2006. Post 2006, this metric has evolved on a deteriorating trend, and bank gross NPAs have grown at an accelerated pace. Both are at 12-year highs. 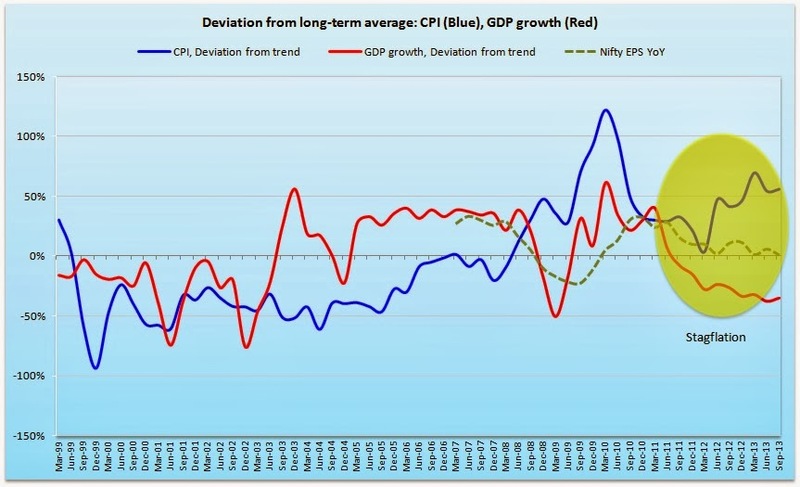 The broad economic slowdown is partly to blame; however, blame ought to be apportioned to bull markets as well, as falling diligence levels incentivise easy access to capital, even to companies ill equipped to handle debt burdens. The gross NPA excludes recast loans, which form a good chunk of advances (10% of loans are NPA + restructured). What could lead to a reversal in this situation? Growth and a stable inflation environment would offer good starting points. How have these been panning out? Two other broad conditions created a supportive environment for equities post 2003. GDP growth picked up and stayed above long-term trend, while CPI ducked and stayed below trend until 2008/09. Since then, these lines have gone in the wrong directions. Achievement of GDP growth forecasts for 2014 & 2015 would still see growth running at 25% below trend, while inflation would be 30% above trend. Economic slowdown has also reflected in earnings. The RBI is focused on reining in inflation (the right thing to do), leaving the reins of economic growth in the hands of the government. As things stand today, stagflation is the path of least resistance over the medium term. Given impending elections next year, reforms momentum has been waning, or being stalled completely. Political will to reform is low and unlikely to materialise until elections. In relative terms, China outlined a reform-oriented plan in its Third Plenum. China's pro-reform agenda contrasts sharply with the stalemated reforms process in India. With the former's economy expected to grow at a faster pace, capital is likely to prefer China to India in the medium term. In sum, earnings and economic growth have slowed down inexorably, while inflation is stubbornly high. Things continue to deteriorate on the balance sheet front. Reversal catalysts are nowhere in sight. In such a scenario, it is hard to justify the equity market rally on the basis of either fundamentals or possible electoral outcomes; sentiment and hope - shaky foundations - are the pillars on which the rally (if sustained) is built.